Jamie Vardy's rise from amateur football to English Premier League winner with Leicester City was something of a fairy tale, but Hannover are delivering one to rival it with the story of Hendrik Weydandt. The dream continued to become a reality for the 23-year-old when he signed his first professional contract in September. A look at the goalscorers on the opening weekend of the new Bundesliga season featured many familiar names. Robert Lewandowski, Arjen Robben and Thomas Müller were on target for Bayern Munich. Vedad Ibisevic struck for Hertha Berlin, Daniel Ginczek hit Wolfsburg's second, and Andre Hahn helped Augsburg to a winning start. One name on the list may have come as more of a surprise, however. 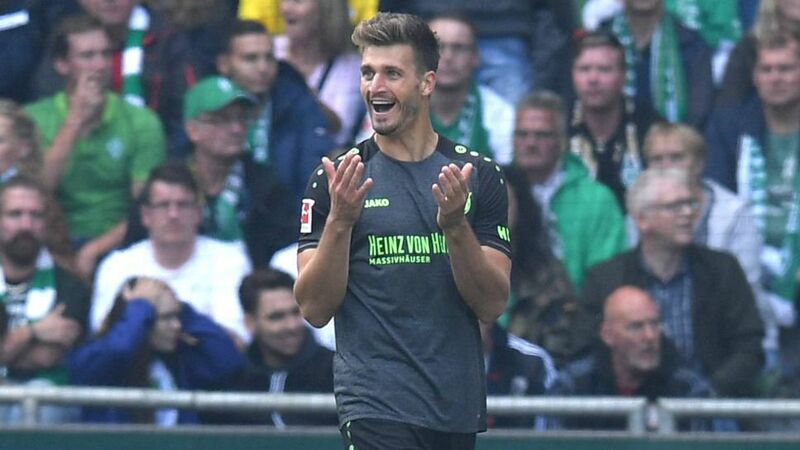 Hendrik Weydandt came on as a 75th-minute substitute in Hannover's 1-1 draw with Werder Bremen and, just like in the DFB Cup a week previously, when he scored twice, he found the back of the net again. What makes Weydandt so special, though, is that he was playing in the Lower Saxony city's amateur leagues just four years ago before working his way up to the fourth division, where he was still plying his trade until a couple of months back. Hannover brought him in from 1. FC Germania Egestorf/Langreder to strengthen their reserve team, but head coach Andre Breitenreiter had other ideas when he caught his eye while training for the second string in pre-season. "I just wanted to see if he could show me his scoring qualities," Breitenreiter said. "He's very hard working, so actually it's no coincidence he's here." Weydandt convinced him, and Breitenreiter decided to take a closer look when his side were winning their DFB Cup tie at Karlsruher comfortably. Two goals in eight minutes on the field, completing a 6-0 rout, had Breitenreiter wondering whether the 23-year-old might be ready for the Bundesliga rather than for the reserves. The answer came on Matchday 1 when Weydandt entered the fray and, within a minute, opened his Bundesliga account. "It's crazy - it's like a fairy tale," said Hannover's sporting director Horst Heldt. "This is what makes football so special. He was still kicking about in the local amateur leagues just a few years ago. I think this was only his second or third time on the ball, and he takes his chance so coolly." It is something Hannover and Weydandt may have to start getting used to, even if the start did not actually auger all that well. "He was so nervous - he made such a mess as he was getting changed," revealed Heldt, who was delighted to see those nerves disappear when the debutant took to the field. Heldt joked that he was expecting a better celebration after the goal, and promised that a professional contract would be on its way to Weydandt. At the start of September, the attacker signed one that runs until 2020. Heldt, meanwhile, stressed that Hannover were only too happy to continue the adventure with their previously hidden gem. From the seventh tier to professional football, the passionate pianist Weydandt is living proof of where hard work can get you, and that it is never too late to realise your dreams. "He's got everything a good striker needs," said team-mate Kevin Wimmer. Luckily for him, Weydandt – and remember the name – will be on his side this season. Click here for more Hannover news and features!